Haggis. The name alone alerts fear in the stomach and makes grown men wince. Made from sheep heart, liver, and lungs and peppered with oatmeal, onion and spices, haggis is boiled in a sheep's stomach and served with "neeps" and "tatties" (turnip and potatoes). Although haggis is considered a traditional Scottish dish, many Scots have never tasted it. Recently, Scotland has once again seen a resurgence on the pop culture map - thanks to trendy Scottish bands like Franz Ferdinand, Belle and Sebastian and Scottish film, such as Red Road, garnering international acclaim. Haggis, however, has yet to reap the benefits of Scotland's new trendy status. Haggis needs a PR make-over. Having recently eaten (vegetarian) haggis, it is evident that haggis has fallen victim to a worldwide bad reputation because haggis is gorgeous! Unfortunately I don't eat meat, but people swear that veggie haggis resembles the real thing. In fact, the veggie haggis I had at Stravaigin - along with their crisp and fresh chips - has been the best meal I have had thus far in Bonnie Scotland. The haggis (both veggie and the real thing) at Stravaigin has been voted the best haggis in Scotland and at £7.95 and £8.95, respectively, is a deal. 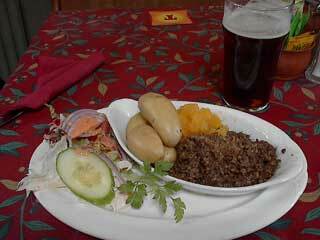 The haggis at Stravaigin - served with creamy and buttery neeps and tatties - is surprisingly spicy and hearty. Haggis is, of course, best finished off with a cold pint of beer. Robert Burns - Scotland's greatest poet - once put it best, describing haggis as the "great chieftain of the sausage race". A great dish and sadly, a misunderstood one. I've had haggis, the meaty kind, and heartily (no pun intended) enjoyed it. I think if it's prepared and served properly it's totally skookum, but if it's not, then it can ruin the whole experience. "A Chinook jargon word that has come into general use in British Columbia, Yukon Territory, and the U.S. Pacific Northwest. It has a range of positive meanings from "'good,' to 'strong,' 'best,' 'powerful,' 'ultimate' and 'first rate.' Something can be skookum meaning 'cool' or skookum can be 'tough.'"